Hello. Welcome to That Roundhouse. This is an ecohome of wood frame, cobwood and recycled window walls, straw-insulated turf roof; with solar power and wind turbine for electricity, compost toilet and reed beds for grey water. We designed and built it over the winter 1997/8, and it was turned down for planning permission several times. After several court appearances, we decided to demolish it over Easter 2004, but changed our minds after demonstrations of huge public support in its defence. The Pembrokeshire Coast National Park Authority attempted to get a court injunction to force us to demolish it, but were persuaded to allow it to stay up until July 2006, when we could re-apply under their new Low Impact Policy. Our new application was considered for six months as we negotiated over all the points of the policy that we had to satisfy. 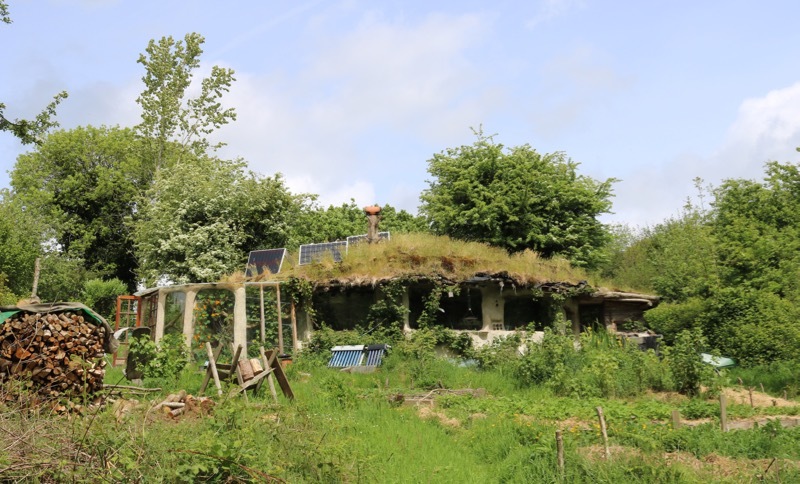 After a refusal in 2007 and several deferrals while Faith (was Jane) worked on a joint application with Emma who lives in a roundhouse across the fields, in Sept 2008 the committee voted to give us and her planning permission, conditional for three years. We signed a s.106 agreement agreeing to stay within the terms of our management plan in June, 2013, and re-applied for permission in June 2016. We received renewal of permission on October 10th 2016, and permission to build a new cobwood workshop. That's a very interesting site, I can see why they have a cat, mice would find those houses very nice places to live !